« How many photos will fit on my memory card? Sometime it can be hard to think of what presents to give for birthday, Christmas, Valentines or anniversaries. Having a record of what presents you have given before can help to provide inspiration, and can help you avoid giving the same present twice. I’ve made a simple spreadsheet for logging gifts and presents. I’ve put some example data in there so you can see how to use it. The rows can easily be filtered by the person’s name, or the event, by using the auto filter options in the header row. I’ve added some example auto-colouring which colours certain events (birthday, Christmas, and Valentines) to make them stand out. 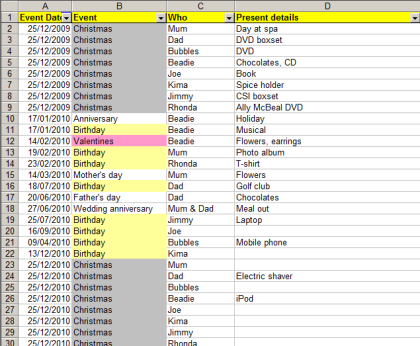 The gift logging spreadsheet can be downloaded with this link – it is only 5kb zipped up. This entry was posted on Monday, March 15th, 2010 at 7:28 am and is filed under Life. You can follow any responses to this entry through the RSS 2.0 feed. You can leave a response, or trackback from your own site.